ISIS-the Islamic State of Iraq and Syria-has taken on the mantle of being the single most dangerous terrorist threat to global security since al-Qaeda. 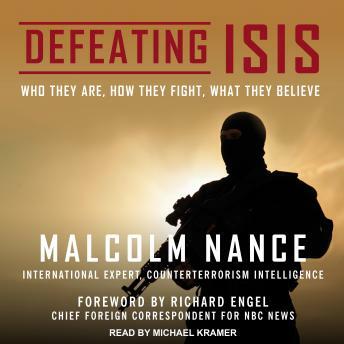 In Defeating ISIS, internationally renowned intelligence veteran, author, and counterterrorism expert Malcolm Nance gives an insider's view to explain the origins of this occult group, its violent propaganda, and how it spreads its ideology throughout the Middle East and to disaffected youth deep in the heart of the Western world. Most importantly, Defeating ISIS gives a step-by-step analysis of the street-level tactics the group has employed in assaults against fortified targets, in urban combat, and during terrorist operations such as those in Paris during the November 13 attacks. As much as ISIS is a threat to Western targets and regional stability in the Middle East, Nance describes not only its true danger as a heretical death cult that seeks to wrest control of Islam through young ideologues and redefine Islam as a fight to the death against all comers, but also how to defeat it. Defeating ISIS is the first highly detailed look into the organization by one of the world's foremost authorities in counterterrorism.